Because of a perceived conflict with the evening Neighborhood Soup Pot Luck Dinner at Spring Glen Church, Best Video Film & Cultural Center has moved its pre-Oscars celebration event to the morning of Sunday, Feb. 24, from 10:30 AM-1 PM. We have shelved the Chili Cook-Off for now. The Oscars Brunch features complimentary mimosas and bagels as well as the previously planned Oscars Trivia Contest presided over by Masters of Trivia Lena Olive and Scott White and Oscars ballot contest. Everybody is welcome to come and celebrate movie culture and community. Support for Best Video Film & Cultural Center programming is welcomed with suggested donations of $5-$25 (contribute what you’d like in that range, or more!). The red carpet rolls out for bowls of red—chili, to those not in the know— when Best Video Film & Cultural Center hosts an afternoon pre-Oscars celebration and fundraiser on Sunday, Feb. 24, from 12:30-3 PM 10:30 AM-1 PM. In the spirit of last fall’s Best Cookie Contest, we debut our “Chili Oscars Cook-Off,” a chili-making contest. Admission is $15 in advance ($20 at the door) for individuals and $25 for two adults (kids included for free). 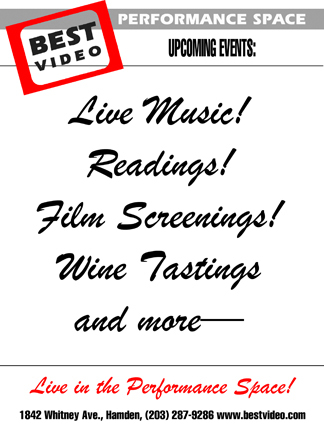 The event will also feature a movie trivia contest with Best Video’s Master of Trivia Lena Olive and Scott White. And, as in previous years, attendees will get Oscar ballots and can compete to see who can correctly guess the most winners. There will be prizes for all the contests. BVFCC is a nonprofit organization dedicated to bringing people, film, and music together. For more information, check bestvideo.com or call (203) 287-9286. Best Video Film & Cultural Center returns with its monthly trivia night, Trivia 237 (or “T-237” for those dystopian future-minded folk) on Monday, Jan. 7. The event starts at 7:30 PM and admission is a suggested donation of $5. Trivia 237—named after the infamous Hotel Stanley room in “The Shining”—is the brainchild of BVFCC barista Lena Olive and her husband Paul Reese. Lena and Paul, the creators and executive producers, also host the event and write the questions. Trivia 237 is a team trivia event comprised of four rounds of quizzing with ten questions per round, for a total of forty questions. Questions cover a wide range of cinema-related (and “cinema-adjacent”) material: film facts, box office statistics, store facts, film score, television, reviews, among others. No portable electronic devices of any kind may be used during gameplay under any circumstances. Competitors may not shout out answers during gameplay, attempt to look at answer sheets of other teams, or approach the executive producers’ table during gameplay. If a team is suspected of violating any of these rules, the executive producers reserve the right to disqualify the entire team for the individual round in which the offense occurred or the entire competition. Teams will be limited to a six-player maximum to allow as many people as possible to participate. Teams write their answers on a prepared form provided by BVFCC. Answers must be written legibly in English. The executive producers reserve the right to disqualify any answers they judge to be too illegible to be considered correct. Where proper names of film/tv/musics are concerned, a correct answer requires that the full name be given. For example, if the correct answer is Dr. Seuss’ How the Grinch Stole Christmas, an answer of “The Grinch” is marked incorrect. In the case of people, giving the last name is acceptable except in cases where there are multiple people with the same last name and the intent is unclear. For example, if the correct answer is “Kevin Smith,” an answer of “Smith” is not specific enough and marked incorrect. But, if the correct answer is “Martin Scorsese,” a response of “Scorsese” is considered correct. Each question will be worth one point, with any extra credit questions being worth an additional point. Scoring points for extra credit questions requires answering the base question correctly in order to be eligible. Every team has one joker to use. The Joker, when used, allows a team to double the total points earned in a round. Jokers do not double extra credit points. After a team writes all of their answers down, if they wish to use their joker, they must write “JOKER” in large, unmistakable print on their answer sheet before it is turned in for scoring. The Joker may only be used once. After all questions are asked in a round, teams are allowed one minute to complete their answer sheets and submit them to the executive producers for scoring. Any late answer sheets will not be scored and the team will score zero points for the round. Cumulative totals of all teams will then be read before the next round begins. After all rounds are scored, the team with the highest overall score is declared the winner. All scoring, as decided by the executive producers, is final. 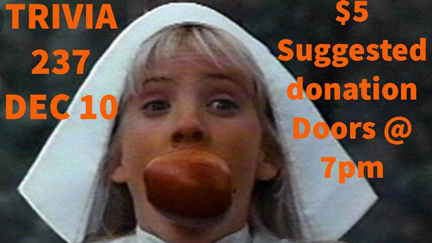 Bring your friends and test your knowledge of film trivia at Trivia 237. T-237 will be held the first Monday of each month unless holidays or other reasons for shifting the date intrude. Best Video Film & Cultural Center returns with its monthly trivia night, Trivia 237 (or “T-237” for those dystopian future-minded folk) on Monday, Dec. 10. The event starts at 7:30 PM and admission is a suggested donation of $5. Trivia 237—named after the infamous Hotel Stanley room in “The Shining”—is the brainchild of BVFCC barista Lena Olive-Reese and her husband Paul. Lena and Paul, the creators and executive producers, also host the event and write the questions. 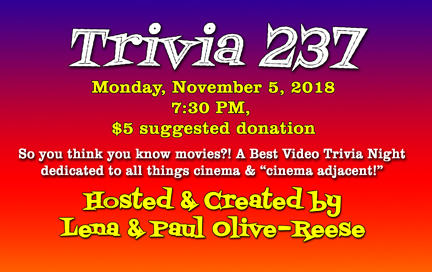 Best Video Film & Cultural Center returns with its monthly trivia night, Trivia 237 (or “T-237” for those dystopian future-minded folk) on Monday, Nov. 5. The event starts at 7:30 PM and admission is a suggested donation of $5. 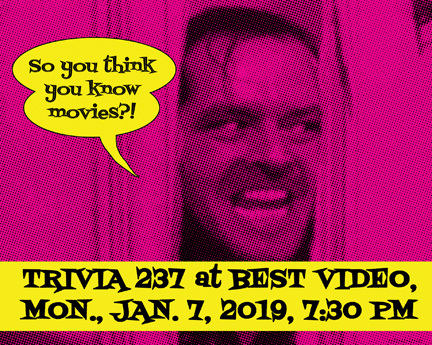 Bring your friends and test your knowledge of film trivia at Trivia 237. T-237 will be held the first Monday of each month.